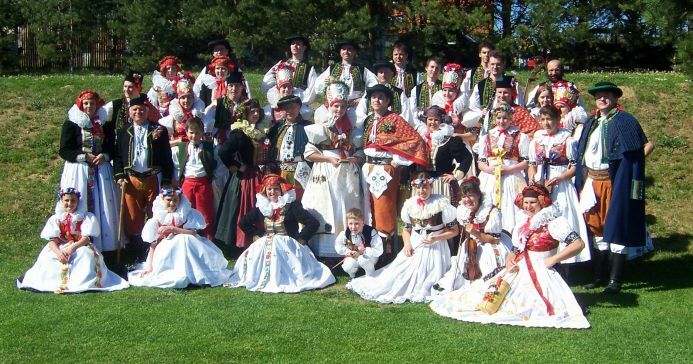 The folklore ensemble Hanačka has been in existence in Litovel since 1981. The ensemble focuses on the traditional folklore of the Haná region - the songs, dances and habits. Haná is a large flatland situated in the central Moravia along the Morava river. The fertile lowlands have ever offered good preconditions for agliculture development and therefore it guaranteed favourable life conditions for local people. The traditional costume has been very various and rich, therefore the dances are quite slow, some are ceremonial. Hanačka presents them in three differend kinds of costumes, designed according to the original ones which were worn till 1850. The most common is the festive costume, the reamaining two are ordinary and wedding costumes. The festive costumes are worn during the majority of performances. The folklore ensemble Hanačka participates in various culture events, celebrations and folklore festivals in the Czech Republic and abroad. The ensemble consists of about 30 members, both adults and children. The endeavour of these people is the beauty of Haná songs, dances, costumes and also the dialect not to fall into oblivion. The dancers dressed up in costumes are accompanied by a Haná cimbalom band, which is composed of singers and musicians. Violins, clarinets, cimbalom and double bass.